This is the second-to-last episode of Tales from the Borderlands and there definitely felt like there were several points where the episode spun its wheels, waiting for the big climax. Our impressions of Escape Plan Bravo. 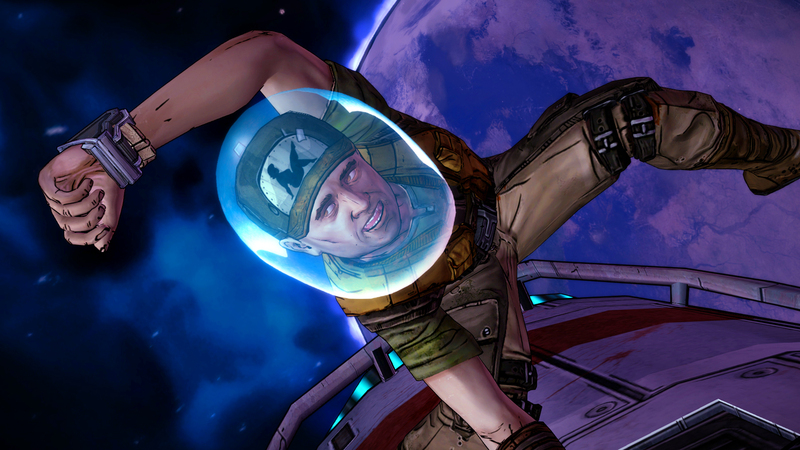 The following impressions represent our ongoing review of the full Tales from the Borderlands series. Be sure to catch up with our impressions for Zer0 Sum, Atlas Mugged, and Catch A Ride. Tales from the Borderlands' fourth episode kicks off with the adage that things are always at the their bleakest just before the ending. That definitely appears to be the case for 'Escape Plan Bravo,' as Telltale Games has upped the story's stakes and sprinkled in some genuine moments of despair and dread. All of this leads to a final climax that more than fulfills its goal of putting Borderlands fans at the edge of their seats. The major premise for this episode centers around a less-than-warm homecoming. To continue their path towards a Vault, the party (held at gunpoint) must find the final piece of the Gortys project. In a cruel twist, it's located aboard Helios, the massive Hyperion space station where Rhys' story first began. The difference now is that Rhys is pretty much a hunted man, so getting by is certainly not a given. That leads into one of the more novel elements of this episode. Whereas Rhys was caught with delusions of grandeur in the first episode about an Ocean's Eleven-style scheme, this episode actually allows him to put such a wacky plan into fruition. In one way, it demonstrates his continued growth over the story, but things going down without a hitch would be just too easy, as both he and Fiona run into their own speed bumps, requiring each of them to wriggle out of them using their unique personality traits. With so much emphasis on increased stakes, one would expect an increase in the action. However, that doesn't quite turn out to be the case. While the previous couple of episodes included some tense action sequences and a few that were reminiscent of Borderlands-style gameplay, Escape Plan Bravo actually takes a step backwards in this regard. There are no truly tense action sequences and, as a result, the story kind of meanders before reaching its intense cliffhanger. Telltale makes up for some of the gameplay shortcomings through its ability to capture the heights and depths of human emotion. Without spoiling the specific plot points, players are presented with a heart-wrenching moment during their journey to Helios, where Telltale presents various options on how to cope with this sudden gut punch. Meanwhile, the latter half of the episode includes one of the most humorous action sequences across any recent Telltale game. This particular sequence is Borderlands at its campiest and is a rare instance of Telltale letting loose with total physical comedy. Ultimately, even with some of the aforementioned moments, Escape Plan Bravo doesn't quite deliver the same emotional punch that previous episodes do. There were a couple of moments where it felt like the episode was simply spinning its wheels, waiting for the ultimate climax, so much to the point that the ending felt rather abrupt. However, the plot twists do set up a final episode that should hopefully deliver on what the series has built to this point. We'll find out if Tales from the Borderlands can live up to the potential shown in the past few episodes in just a few more months.